Holidays are filled to the brim with nostalgia. Get an even larger portion of the good stuff this season thanks to Omaha’s bevy of area museums and historical attractions, many which offer magical ways to soak up the holidays. Downtown, The Durham Museum, Omaha’s former Union Station, is home to year-round exhibits, displays, train cars and hands-on activities. Christmas at Union Station begins November 23, where the region’s largest indoor Christmas tree graces the Grand Hall and is the dazzling centerpiece to holiday events, concerts, and visits from Santa. Just east in downtown Council Bluffs is the Union Pacific Railroad Museum, UP’s only museum and housed in a former Carnegie library. Head west to world-renowned Boys Town, a National Historic Landmark District complete with chapels, statues and gardens, a museum, and Father Flanagan’s House. The Visitors Center is home to the world’s largest ball of stamps and a Christmas Stamps exhibit. Beginning December 1, view historic Creche displays. A drive away is Strategic Air Command & Aerospace Museum, home to the nation’s largest collection of Cold War aircraft and artifacts. Kids will love the Children’s Learning Center and the Star Wars-infused Santa Goes to Space event on December 1. Travel back to the nineteenth century in Omaha’s Florence neighborhood. At Mormon Trail Center at Historic Winter Quarters, immerse yourself in the great Mormon exodus of the 1800s and tour a makeshift cabin, pull a handcart, and “travel” by covered wagon. While there, marvel at sweet creations during its Gingerbread Festival. Down the road is the General Crook House Museum decked out for the holidays. View period costumes, furnishings, and decorative arts. 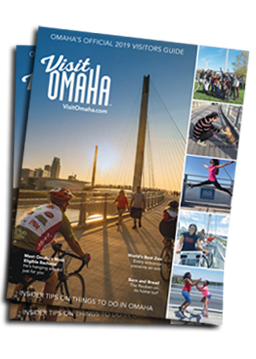 Double the fun this holiday season in Omaha with a generous helping of history sprinkled with holiday cheer. Click on the boxes below for more holiday historical experiences.